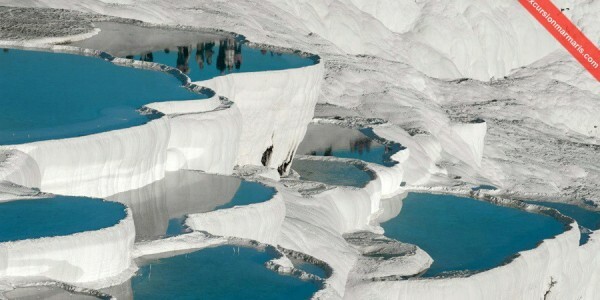 Pamukkale located at about 210 km from Marmaris is a perfect work of art by Mother Nature! 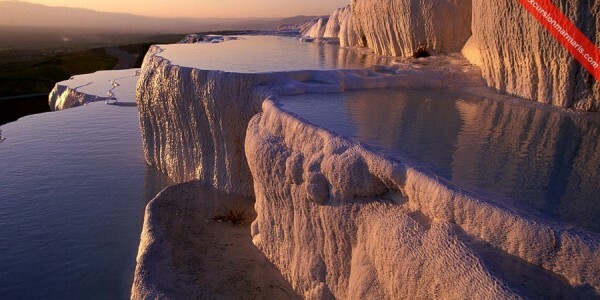 This most unique and amazing location appears as if a huge pile of cotton has been deposited at one place. Pamukkale literally means ‘Cotton Castle” in Turkish. 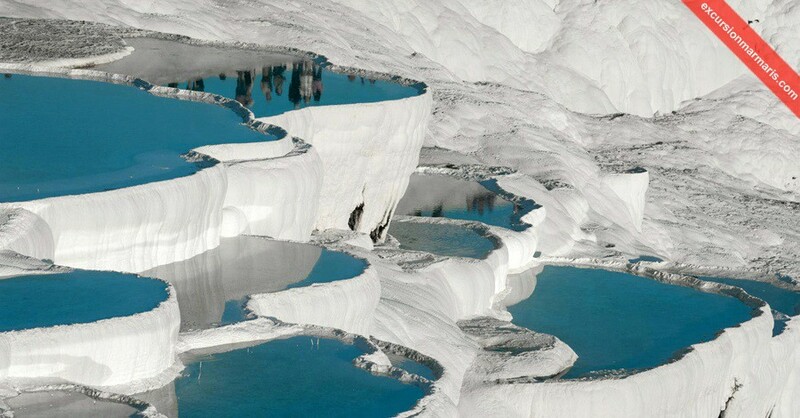 Pamukkale is the most popular natural park in Turkey and this place has been accredited with the status of ‘World Heritage Site’ by UNESCO. We arrange daily private tours from Marmaris, icmler and Turunc to Pamukkale. 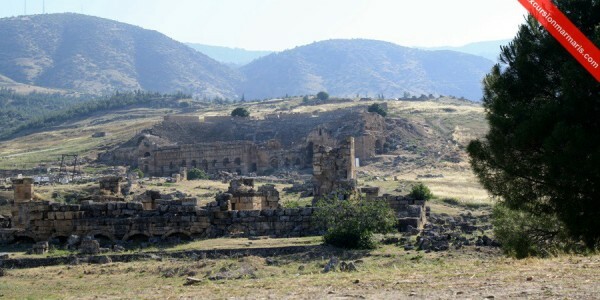 The great thing about these private tours is that they can be arranged at anytime of the year. We can provide best maintained vehicles for your exciting full day excursion to Pamukkale and nearby places. 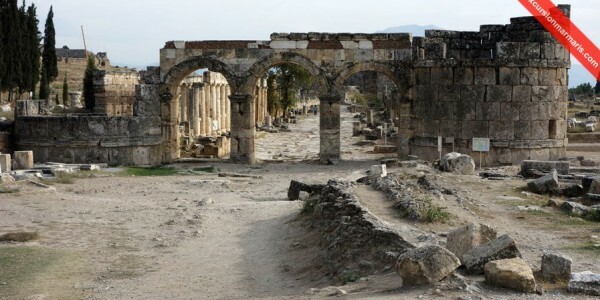 Visitors participating in these special tours are free to plan their own itinerary and go around places they prefer most. Our marmaris private pamukkale tour includes convenient pick up and drop back services to your hotel in Marmaris, icmler or Turunc. We will arrange to pick you early in the morning at about 6:30 am and drop you back to your place around 7:00 pm. We also arrange for guiding services. 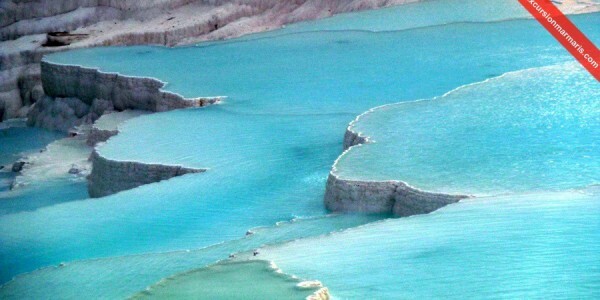 On our private tour to Pamukkale, you are free to plan the trip and select places where you would like to stop, spend more time, select eat-out places, and also have food of your preference. If you let us know in advance, we will arrange for your food type, whether it is vegetarian or helal – we take care that you have it at the right time! 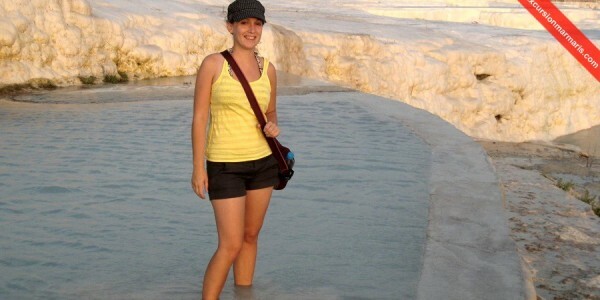 Costs of our marmaris private pamukkale tour is calculated on the number of people joining the trip, the food and refreshments you choose, transfer, entrance fee and such other facilities. However, we advise you to bring sunglasses, towel, sun cream, comfortable shoes and swimming costumes while coming to this tour. 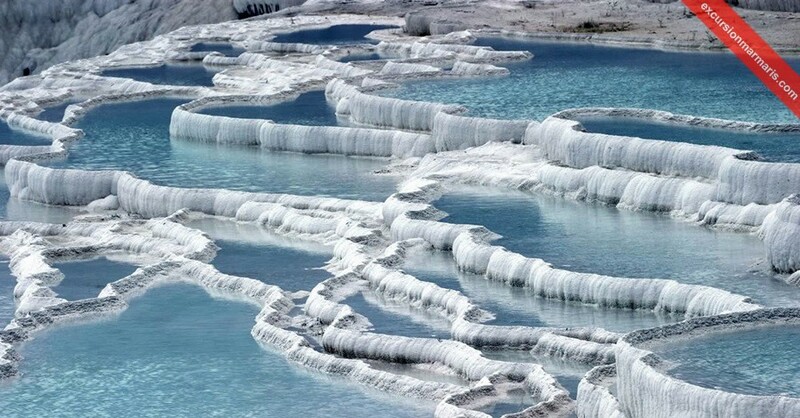 Pamukkale has thermal hot springs that have formed huge calcareous white steps with their continuous flow since thousands of years. Hierapolis and Necropolis are the ancient sites that you can visit here. 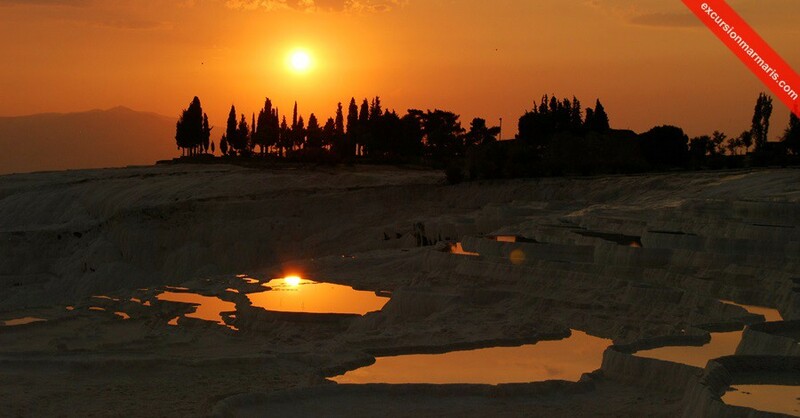 You can also enjoy a swim in the Sacred Pool among the ruins of the Hierapolis. 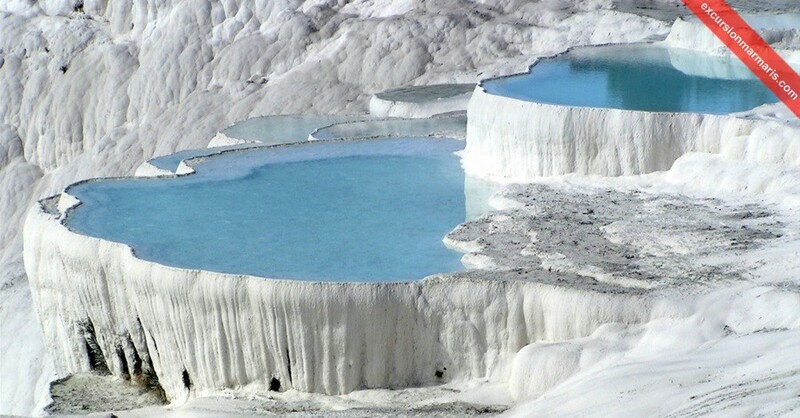 Pamukkale has been a popular thermal spa center since ancient times and it still continues to attract visitors for the same reason! 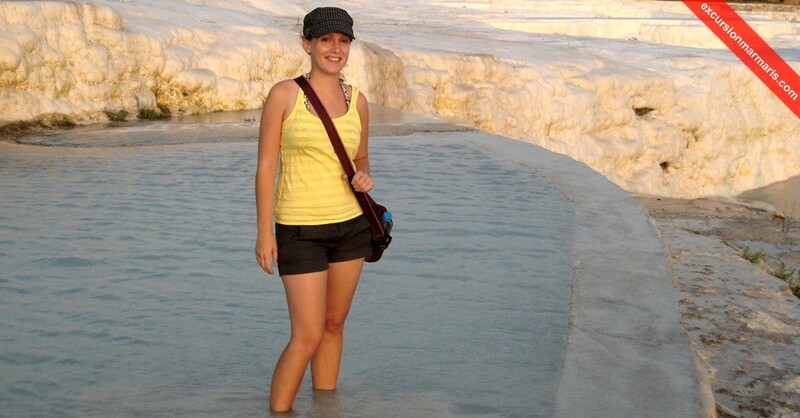 We are specialized in organizing private tours from Marmaris, Turunc or icmeler to Pamukkale. Let us know more details of your itinerary, travel preferences and number of people in your group. 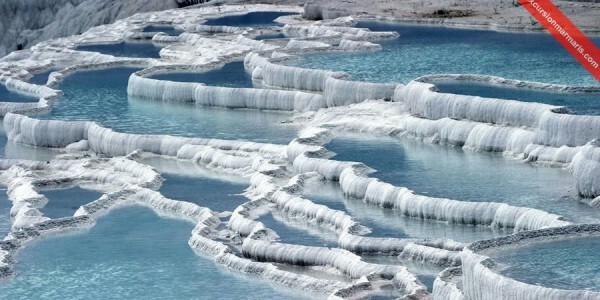 We ensure that you enjoy this special excursion to Pamukkale. Don’t Forget: Sun cream , Sun glasses, Camera,Swimsuits, Towels , Hat. 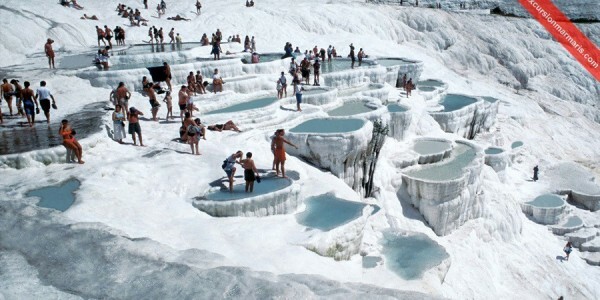 Private Pamukkale Tour from Marmaris, icmeler or Turunc. Pamukkale is about 210 km from Marmaris and it takes about 3 hours to reach this place. 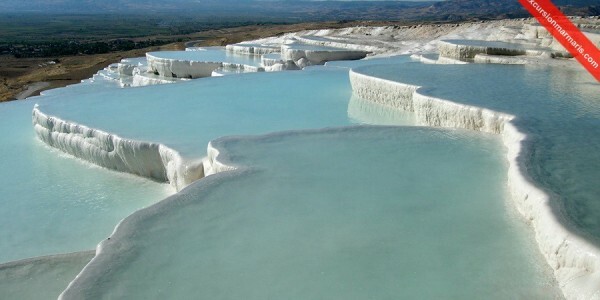 During this journey, you can enjoy watching pristine nature, countryside, small towns, and cotton and tobacco fields. The Sacred Pool, also known as Cleopatra’s Pool is famous for its hot spring water enriched with minerals. 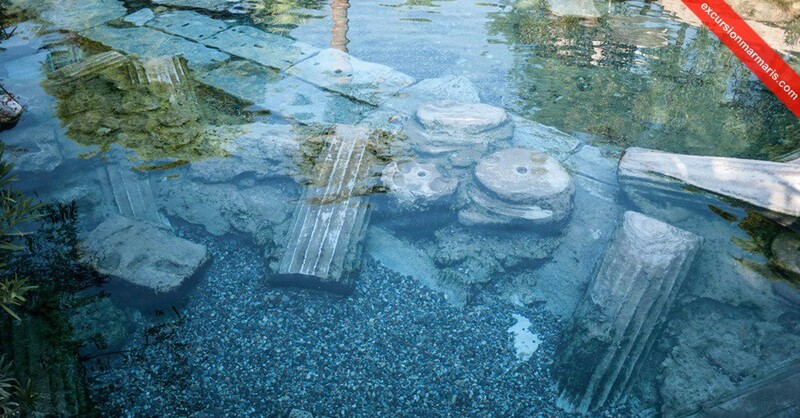 The pool is littered with columns of the ancient Temple of Apollo and you can enjoy swimming here at a prescribed fee. 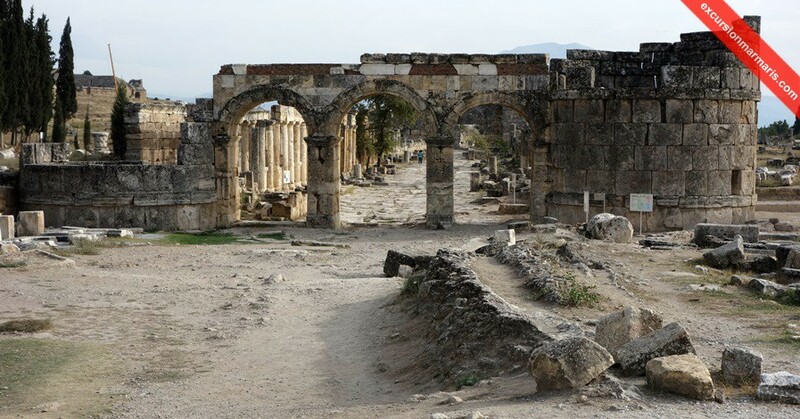 Hierapolis, the ancient Roman town is the foremost spa center in this region. 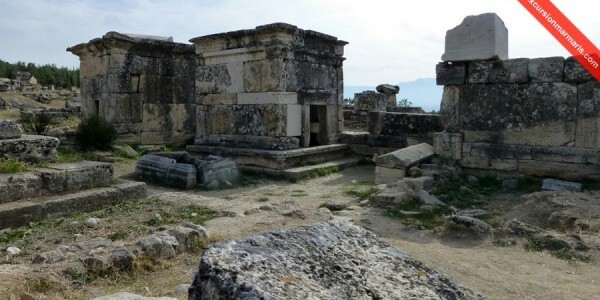 The archeological museum, Necropolis, the ancient Roman Theatre are places that you can visit here.